3D artist, Model source: Poser 6 standard model posing source. Poser and Daz software have many human, men, women, and body and pose pre-sets. Working with them is not modeling which includes complex mesh modifiers, but rather a predesigned figure staging. Though, making a complete scene in poser is hard due to many modeling boundaries. Still, the software is very easy to operate. The models do not contradict of the e-frontier copyrights. Model morph target based on the Poser Restricted Content, but does not include the original mesh connectivity information. 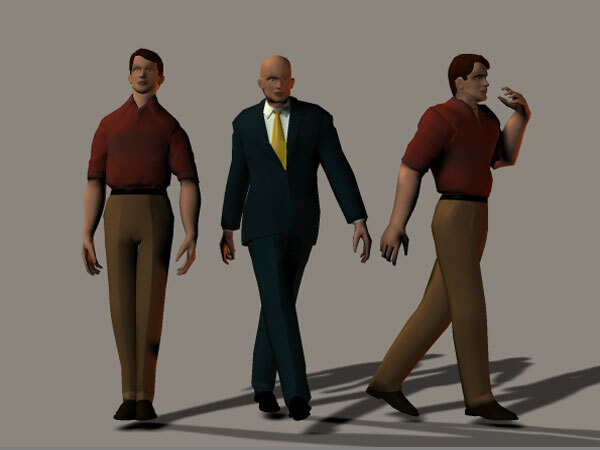 Walking men models, three male group figures, low polygon models for game and architectural scenes. businessman, boss, business, body, attitude, businessperson, carefree, casual, caucasian, confident, contemporary, corporate, entrepreneur, executive, formal, full, full-body, intelligent, isolate, isolated, male, man, mature, one, people, person, portrait, standing, adult, arms, . Guest, 2012-09-21 03:04:10 good job! Maciek, Poland, 2011-01-22 03:07:42 Thanks a lot! you're doing an awesome job! Guest, 2010-08-01 21:52:24 Thankyou so much for the model, but your website is VERY hard to nagivate and the download button was almost impossible to find ( I had to get my 12 year old to find it!!) You must loose sales. Nick, England, 2009-03-17 00:38:18 How in the hell do you download these things??? ?